Jodie Marshall has been making beads based on palettes I offer in my latest book, “The Beader’s Color Palette.” She’s used the palettes either as they are presented, or as a starting point for her own creative color use. 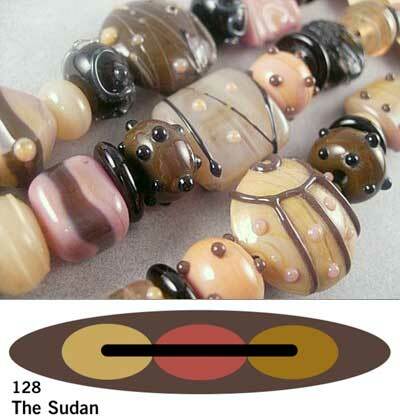 These are gorgeous beads! You rock, Jodie! Thanks for sharing your talent so freely. Temple Doors. 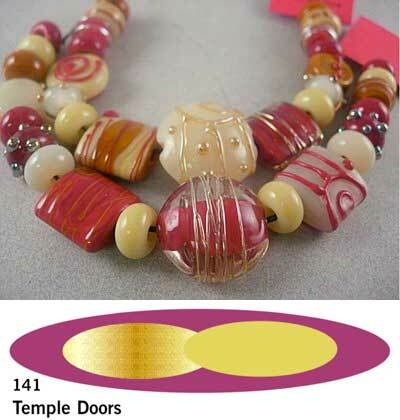 This palette was inspired by doors to a Laotian temple and use a simple yet stunning palette: crimson and gold. The Sudan. A warm palette from across the plains or desert, and found on African wood carvings all over the continent. Topaz lifts the scheme with its light, and orange injects vitality. Matte finishes provide a chalky, dry, earthen texture. love the beads –are they for sale ?? Ask Jodie if they are for sale – they are her beads, and the first 2 words of the post are a link to her blog.